Services / facilities within the building include a swimming pool, fitness suite, theatre, Sir John Loveridge Hall (sports hall), squash courts, David Ferguson Hall (dance hall), meeting rooms, creche, children's play area and parks bar and cafe. 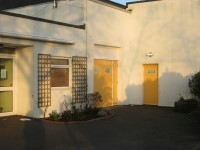 Services / facilities within the grounds include outdoor sports pitches. You are on Opening Times (Cafe). Skip to the next section. 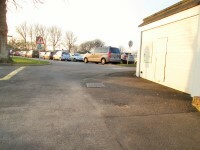 There is/are 9 designated parking bay(s) within the car park. 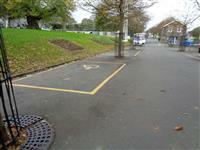 The dimensions of the designated parking bay(s) are 300cm x 440cm (9ft 10in x 14ft 5in). 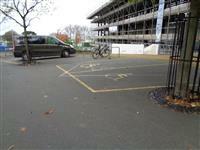 The furthest designated bay is 35m (38yd 10in) from the main entrance. 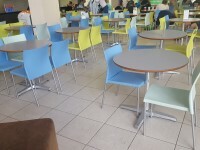 You are on Eating and Drinking (Parks Cafe). Skip to the next section. 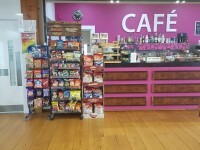 The cafe is located ahead as you enter. 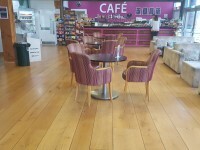 There is a steep slope leading into the main seating area and service counter. 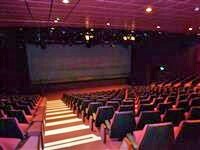 There is step free access to the seating located to the left of the main seating area. You are on Polling Station. Skip to the next section. 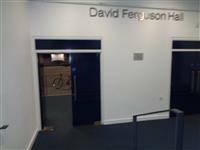 The polling for St. Peter Port North is located within the David Ferguson Hall. 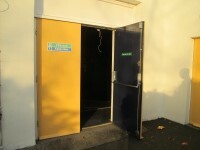 Voters will enter through the fire doors which are to the left of the main entrance, adjacent to the Ron Short Centre. 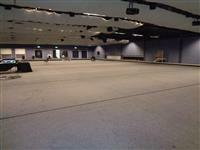 The booths will be set up on the main hall floor. The doors open towards you. The doors will be held open during polling. There is a moderate ramp located in front of the entrance. There is a single deep, clearly marked step (without a handrail) to access the main floor. 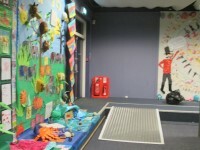 Alternatively there is a temporary steep ramp from the fire door down to the main floor. The ramp does bypass the step. You are on Level Change (Level 1). Skip to the next section. The step(s) is / are located leading down to the lower levels. You are on Lift (Level 1). Skip to the next section. The lift is located on level 1. The floors which are accessible by this lift are L1-M-1. The lift is 36m (39yd 1ft) from the main lift. The dimensions of the lift are 75cm x 170cm (2ft 6in x 5ft 7in). You are on Lift (Stage). Skip to the next section. The lift is located next to the stage. The lift is 50m (54yd 2ft) from the main lift. The dimensions of the lift are 80cm x 115cm (2ft 7in x 3ft 9in). Designated seating is located at the rear of the auditorium. Companions sit directly next to you. 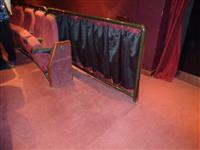 The nearest accessible toilet is 25m (27yd) from the designated seating area. To borrow the wheelchair please ask at reception. The ramp or slope is located leading into the theatre. The lift is located in the main foyer. The lift is 34m (37yd) from main entrance. The dimensions of the lift are 122cm x 126cm (4ft 0in x 4ft 2in). The fitness suite is located on level 3. 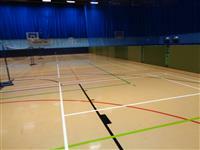 The fitness suite is 12m (13yd 4in) from the lift. The opening is 162cm (5ft 4in) wide. Equipment suitable for mobility or sensory impaired users includes Free Weights, Treadmill, Arm Extension, Back Extension, Dual Adjustable Pulley, Leg Extension, Seated Row, Arm Curl, Leg Curl, Pectoral Fly. You are on Level Change (Squash Courts). Skip to the next section. The steps are located leading up to the courts. You are on Level Change (Sausmarez Room and Stage). Skip to the next section. The ramp or slope is located leading up to the areas. You are on Level Change (Fitness Studios 1 and 2). Skip to the next section. The ramp or slope is located leading up to the studios. The facility is 54m (59yd 2in) from the main entrance. 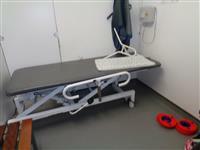 The dimensions of the accessible changing room are 370cm x 190cm (12ft 2in x 6ft 3in). 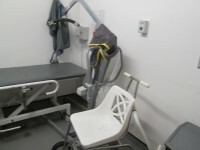 The accessible changing room has a manual hoist and a ceiling tracking hoist. The length of the bench is 170cm (5ft 7in). Baby change facilities are located within the accessible changing room. A push button alarm is 120cm above floor level. 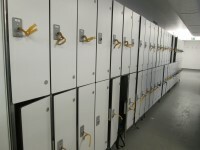 There are lockers at an accessible height, adjacent to this changing room. You are on Accessible Toilet (Main Foyer). Skip to the next section. This accessible toilet is 32m (34yd 2ft) from the main entrance. 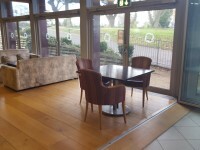 This accessible toilet is located in the main foyer opposite reception. The dimensions of the accessible toilet are 195cm x 215cm (6ft 5in x 7ft 1in). The lateral transfer space is 145cm (4ft 9in). You are on Accessible Toilet (Lower Level 1). Skip to the next section. This accessible toilet is 1m (3ft 3in) from the level 1 lift. This accessible toilet is located to the side as you exit the lift. The dimensions of the accessible toilet are 140cm x 255cm (4ft 7in x 8ft 4in). You are on Accessible Toilet (Stage). Skip to the next section. This accessible toilet is approximately 12m (13yd 4in) from the stage lift. This accessible toilet is located behind the theatre stage. The dimensions of the accessible toilet are 180cm x 255cm (5ft 11in x 8ft 4in). This accessible toilet is 52m (56yd 2ft) from the main entrance. This accessible toilet is located in the wet side changing area. The dimensions of the accessible toilet are 135cm x 155cm (4ft 5in x 5ft 1in). The showers are located within the accessible toilet. The facilities available in the accessible shower are an adjustable shower head, handrails and a shower chair. Other facilities available are a hoist chair for transfer into the pool. 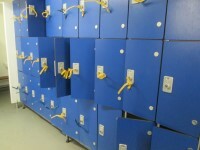 There are no lockers in the cubicle but a rank of larger lockers are adjacent in the main changing area. The standard changing room is 52m (56yd 2ft) from the main entrance. The standard changing room is 10m (10yd 2ft) from the swimming pool. The standard changing rooms are located on level 2, behind reception. The shower cubicle(s) / area is / are accessed via a moderate slope / ramp. The standard changing room is 12m (13yd 4in) from the main lift. 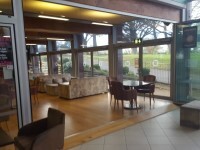 The standard changing room is 22m (24yd 2in) from the reception desk. The standard changing room is 6m (6yd 1ft) from the fitness suite. The standard changing rooms are located on level 3, next to the fitness suite. The female and male toilets are located in the main foyer opposite reception. There are additional standard toilet facilities located throughout the leisure centre.